Acorns class have been singing Hickory Dickory Dock. 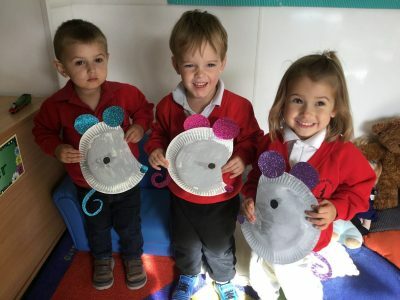 We made some beautiful mice using paper plates and made clocks by stamping numbers onto rectangles. We have had great fun playing with coloured rice, filling, tipping and emptying pots. This week the children in Pippins class have been busy making decorations for the chapel for both the Harvest Assemblies. We printed with oranges and made a beautiful harvest sign using autumn coloured handprints. We have also had lots of fun with bubbles. The children loved jumping around trying to catch and pop bubbles and it’s lovely to see them all so happy!